This president has set the country on a course for fiscal apocalypse -- and that is no joke. And...it's all on purpose...he is knowingly destroying this country - if we let him. Maybe our SCOTUS, if they have the guts, will cause the house of cards to fall when they announce their decision in June. The worst that could happen is the Speaker of the House would be the POTUS before the elections. "The worst that could happen is ..."
You might want to rethink the word "worst" ... many think that would be the BEST that could happen. Considering that the Debt Clock was busted in October of '08, I would say that this graphic was "massaged" for maximum visual impact. Not calling it dishonest, but just wondering where the fine print is. 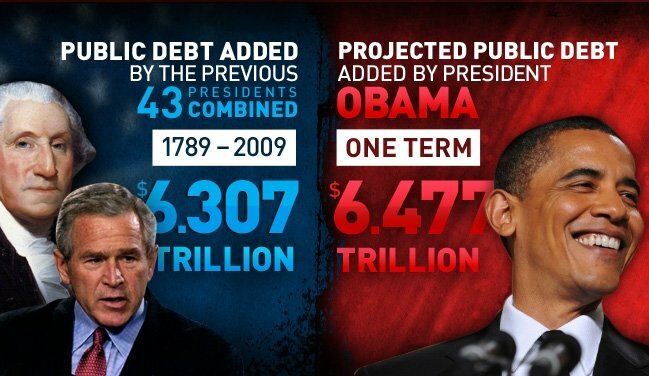 Why do those two numbers add up to $12.784 trillion when we owe much more than that? Shouldn't they add up to around $16 trillion? Four more years.... for Obama to produce his real birth records.